Last time I was out to visit Shoryumen, I was in a bit of a rush. I was hoping to hit up some ramen and a sushi cone at one time. 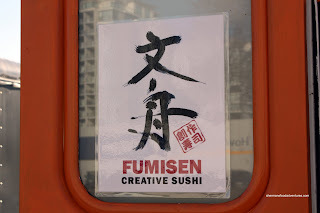 Apparently, the guy who runs Fumisen was out at the bank and wasn't expected back for a couple of hours. Uh... a couple of hours??? Well, I couldn't hang around even for 2 minutes, let alone 2 hours. Dejected, I left knowing that my next visit to Richmond would not be soon. Well lucky me... Costanza wanted to watch Avatar 3D IMAX at Riverport today. How convenient! Let me just say the movie is a visual delight, especially in 3D IMAX (very trippy!). I really didn't want to get popcorn for the movie since I wanted to save room for more food and also, it's not very healthy. Of course, it had to be a special where we get a medium popcorn and large drink for no extra charge. How things conspire against me! Despite having the opportunity to pass up on the free offer, guess what I did? Seeing how I really shouldn't be eating that much, we proceeded to Shoryumen to try out their Ton broth which was expected in today. Arggh!!! Delayed to the 12th! Ah zut! Fine, I settled for the Kuro, while Costanza had the Aka. 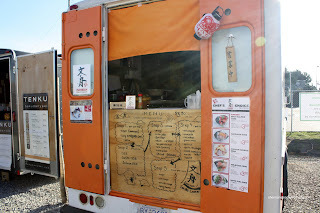 Dusting off the modest bowl of ramen, we set our sights to the cart next door for some sushi cones. Apparently, the guy who runs the place worked in a Japanese restaurant prior to this. He makes small batches of sushi rice to keep things fresh and consistent. Costanza ended up creating his own cone (sounds weird to say that...). There are 5 steps where you choose your wrapper, rice, filling, 2 veggies and the sauce. 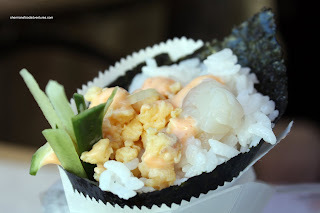 He went for a Scallop Cone with nori, cucumbers, tomago and chili mayo. Unlike some other places, the ingredients made it from the top all the way to the tip of the bottom. Chewy, with every grain visible without degradation, the sushi rice was fantastic. Tack on fresh ingredients and we have a winner (all for $3.50). Trying to be a bit different I went for an Unagi Cone with soy crepe (50 cents more) with sushi rice, avocado, cucumbers and chili mayo. The same qualities from Costanza's cone applies here as well. This turned out to be a pleasant surprise. We originally went for the ramen with much excitement while the cones being the snack. However, we liked it more than the ramen (despite being different things altogether). Sorry if this is a thick question, but what exactly is Ton broth? Googling results in a lot of hits on "won ton" and I'm curious now. Hi Tony, the Ton broth is short for Tonkotsu which is made of pork bones and fatty pork. There are no "thick" questions, we won't know until we ask. Wow.. look like next time I am there, I will have to go hungry, as I have to eat a giant takoyaki which I love, a bowl of ramen and now added to the list: a sushi cone. Yes Jenny, I really hope they don't add a few more like they are planning to. I'll have to eat way too much while I'm there! Thanks for giving me the heads up on this place. I was looking for a new foodie experience, after all the Olympic related ones, and this one did not disappoint. The omurice cone looks very interesting to me. Maybe I'll try that next time with the ramen next door. They have the ton broth now. 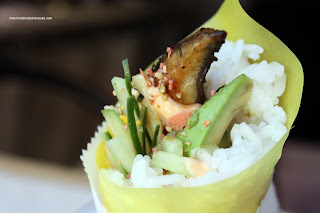 I really enjoyed my unagi/avocado/mango/mayo cone. It was a great appetizer while waiting for my tenkubakudanyaki. Hey Holly, give the credit to Jessica at Yum-O-Rama. I got the idea from her! What a tasty treat eh?